"Agricolox" received the Hopewell Valley Arts Council Award. Congratulations! My ox, named “Agricolox” (which is a play on the Latin word ‘Agricola’ for farmer) is a homage to both the rich, deep and important history of farming in the Hopewell Valley dating back to the early 1700’s, as well as a nod to the resurgence of small scale and sustainable farming and the emergence of food stands and farm-to-market efforts taking place here today. The ox design displays the eco-culture of high summer in the Hopewell Valley. The background of Agricolox shows the golden fields of a typical farm seen throughout the Valley in late summer. Layered on top of the landscape is a depiction of the many types of prominent vegetables and flowers that are plentiful and available from the farms and gardens across the region such as corn, jersey tomatoes and zinnias. 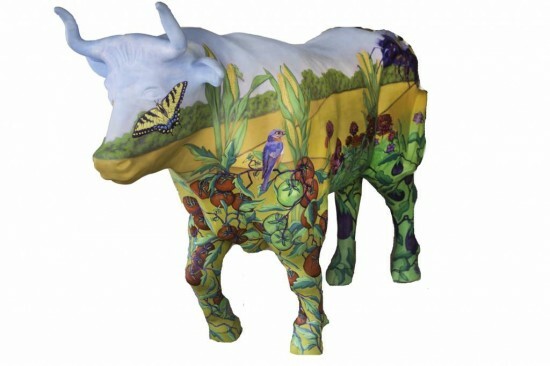 Also included are whimsical portrayals of birds, bees and other insects that populate and enjoy our gardens and meadows. I used water soluble oil paints, technically oils; I find the paint to be pretty, brilliant and saturated with color. This paint is one I use most frequently in my plein air painting as it allows me to create both delicate washes as well as impasto brushwork. The water soluble oils have a lot of the positive characteristics of acrylics yet with better durability and vibrancy. Since “Agricolox” represents summer to me, I wanted paint colors that reflect the grand and vivid colors of summer in the Valley.